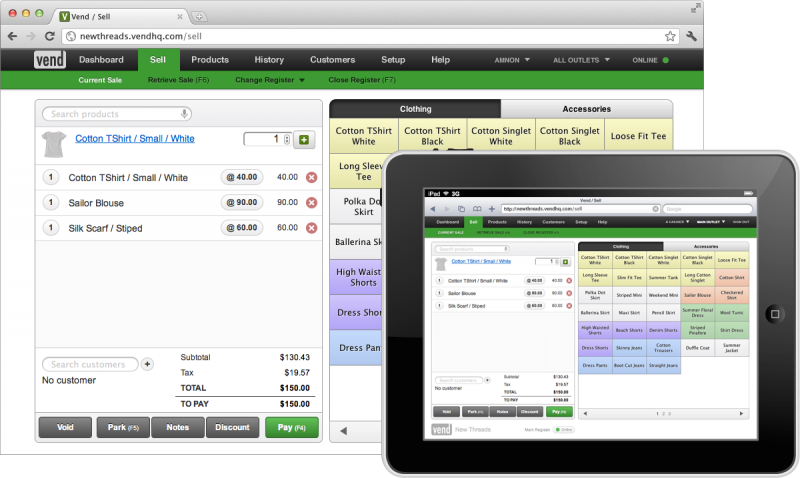 Vend is point of sale system and inventory management software that has a nice clean user interface, is simple to use and has a very low start up and running costs (especially when you compare it to the horribly overpriced and ancient systems like Cybertill). Moreover, if you can use Google Chrome on your computer Vend will almost always work, making it virtually platform independent and yes it works on your iPad or android tablets too. My favourite feature is that it just plugs straight in to Shopify ecommerce. Shopify is great and the fact you can have the two systems talking to each other with a few clicks is superb and unlike cybertill who charge you £2000 to let you use their API the Vend Shopify integration is free. Lightspeed is great, but, expensive especially with the support packages and they will also charge you to integrate it with Magento. Erply is good too (not quite a slick as Lightspeed), when I set it up for a customer they offered a free Magento Synchronisation module. Sadly now they have withdrawn support for it and charge a Minimum of £5000 for integration work, for that you could easily switch to Vend and have plenty of change to invest in new stock or pay some bills. Back in the day Checkout for Mac looked really promising and was being developed by a very clever little software company called Sofa who since got bought up and frankly since then nothing much has changed. As far as I am concerned the only thing Cybertill has got going for it is very persuasive sales reps. Steer very very clear. Did I mention that it is probably the most expensive solution I have talked about here. Theirs is the only website with no prices on it and for good reason. Just a note. I am talking about integration with Magento and Shopify etc, I should also add that Lightspeed, CheckoutApp and Cybertill offer integrated online shop solutions as well, for an extra fee. I have to say they are all limited and I wouldn’t recommend any of them, but, by far the worst is the cybertill one which must have been coded sometime in the 80’s, in fact it is hard to stress how terrible it is, but table based template layouts should give you a clue. I have been playing with it today with a Star Micronics printer, a Symbol Barcode scanner, an Elo Touch touchscreen monitor and a Mac Mini, after realising I need a mini display port to DVI adapter, everything is working beautifully. If I was gonna start a shop, I would use this. This entry was posted in Blog, News and tagged blog, magento, point of sale, pos, shopify. Bookmark the permalink. I am on the fence for my new shop. I am between going with VEND or LIGHTSPEED. I have a retail clothing store and both would work great with it. I just don’t know which to choose. I know in the end I can make both work so it’s hard to find that one thing that would really tip me over to one side. PLEASE HELP! For me I would start with VEND, but, with Apple hardware. If you go straight in with Lightspeed you have to pay for the licenses upfront, and your support etc. I often tell Clients that once all their data is on an Epos system, swapping it to another one is no big deal. VEND Doesn’t have as many features as Lightspeed and is arguably not as good software, but, it certainly works well enough for small and medium shops, if you run your shop on Macs, you can fairly easily transfer to Lightspeed at a later date when your growth requires it. You can cancel your VEND subscription anytime. Depending on where you operate from there may also be tax advantages in “leasing” software on a monthly basis over buying software… but, that is for accountants. Also, your choice of ecommerce system may influence the decision. Vend appears to be a great pos platform. I like the fact that it integrates with shopify and the ability to ring up sales offsite anywhere there is a wifi connection. I paid a$650 for checkout license! Everything is good but I’m moving to vendhq and trying to sell my copy of checkoutapp! Checkout is designed for USA and not Australian businesses! It don’t allow me to give discount from sales price as amount but it discount percentage only! Also I can not enter sales price gst inclusive I ve to manually calculate gst exclusive then type in the price!